13) Watch Nivsta Boards on youtube at Nivsta Boards to see how to play the game. K,P.I, H.S,A. Coming on day at YouTube. Note Remember to chalk your rules. 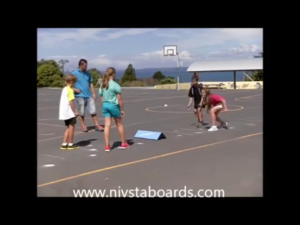 You may wish to use a stopwatch, watch or mobile to time yourself how many throws and catches you can make in thirty seconds, one metre away from the Nivsta Board.